Outlook has been with us a very long time. Some of the people that I train have been using it for many years. Despite this, I still find people who do not know how to set up and use various signatures for their email messages. We all make sure that we start a message with an appropriate salutation. It is, at the very least, polite. It follows, therefore, that we should end an email with our name. 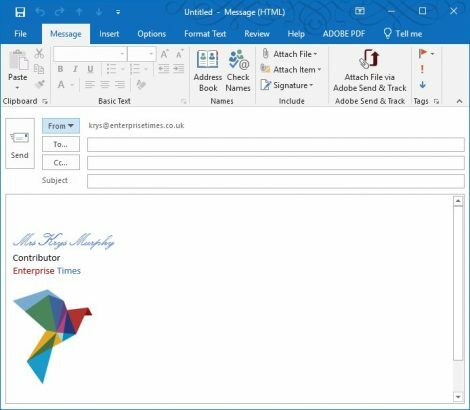 If this is a business email then adding your company logo and even your contact details makes sense. You can also place any text you would like there too such as a disclaimer. Start by opening the message window. 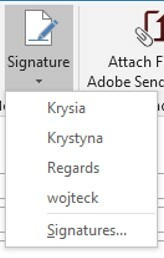 Select the Signature Tool. A list appears. Select Signatures at the bottom of this list. This dialog box displays a few signatures I have created previously. 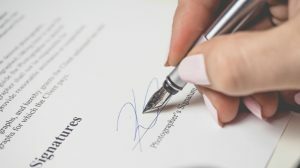 Give your new signature a meaningful name. I shall be creating my company name position and using the logo too so I shall call this one “Enterprise Times”. 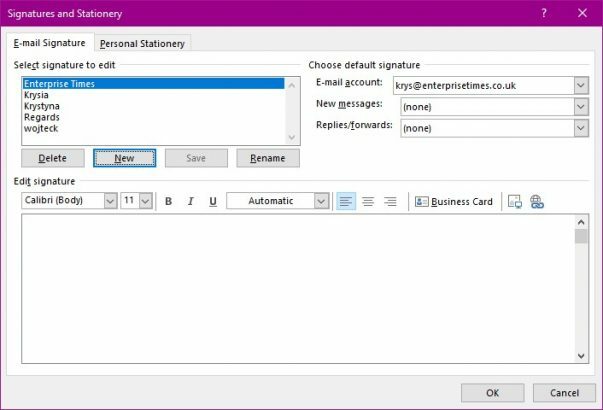 In the section on the right of this dialog box can set a signature to be used on a specific email account. 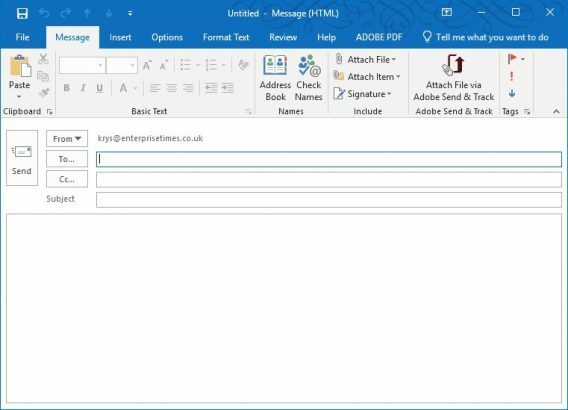 You can also configure it to appear automatically when you create a new email and / or when you reply or forward an email. Click in the lower box below the font choices. 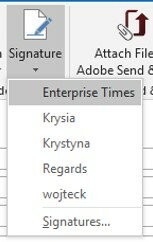 Type the signature you require. 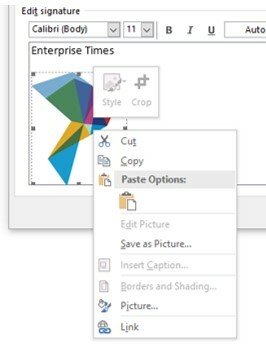 If you want to add a logo then select the picture tool. Locate the logo file. Select it and it will be inserted into your signature box. It is much easier if your logo is at the correct size but you can resize it. Right mouse click on the logo. Select picture from the list. 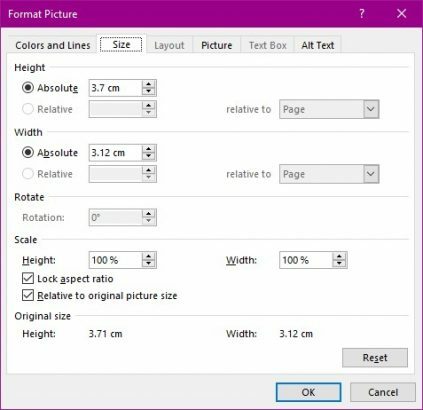 In the Size tab you will find the height and width settings that you can change. Once you have changed the logo to the correct size click on the OK Button. You are returned to the Signature dialog box. Change any formatting of the text that you need to. 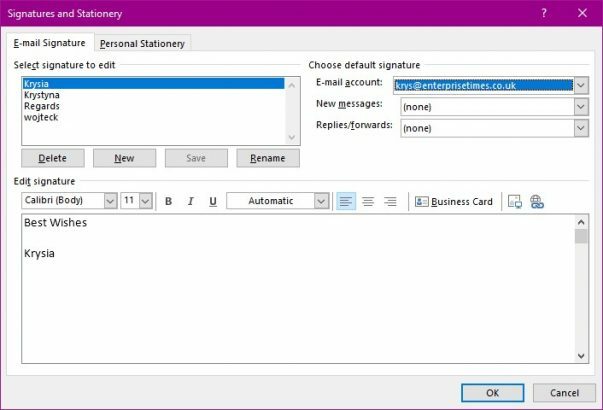 The first time you use this signature you can chose it from the list from the Signature Tool. 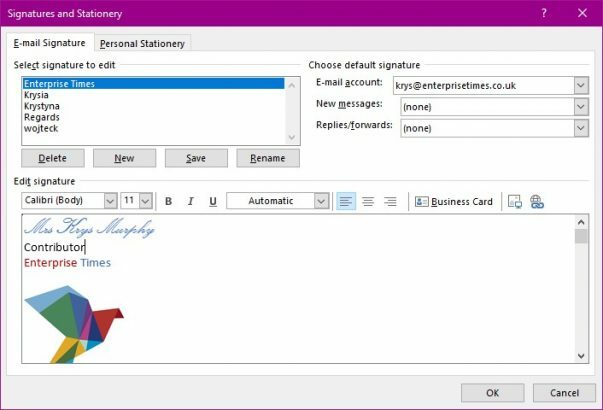 If you have set the signature to appear automatically then you can create a new message and you will see your new signature at the bottom of the message. Of course having several you can chose from the list dependant upon the message you are sending. You can change you mind before you send it off.